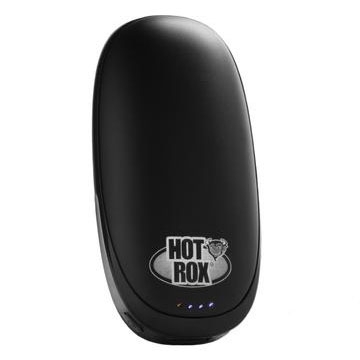 HotRox Electronic Hand Warmer - Double Sided Heat With Power Bank. The New HotRox Double Sided Electronic Hand warmer with Power bank feature. HotRox is recharged from USB, so can be charged from any existing mains USB Charger or PC. It sits comfortably in the palm of your hand and provides heat on demand, it lasts up to 6 hours , has two heat settings (45 and 50 degrees) and gives 2 full charges to your smartphone. HotRox is a lifestyle product - keep in touch and keep warm!